He was small in stature, but big in every other sense of the word. 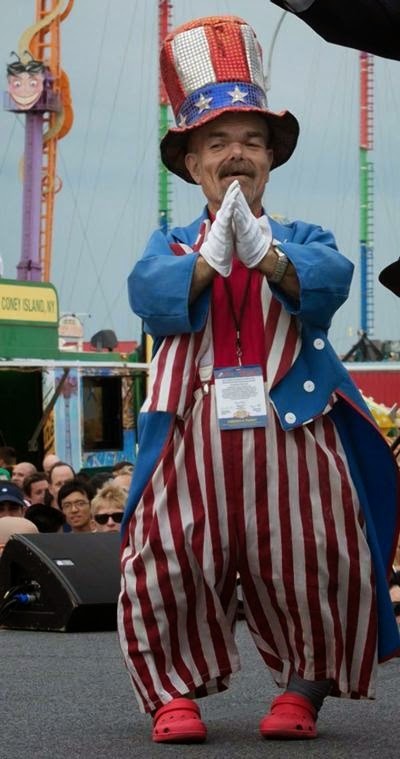 Coney Island performer James Mastrangelo, affectionately known as "Little Jimmy," died Saturday, April 4 at age 68, friends and colleagues said. A little person originally from Bay Ridge, Mastrangelo gained worldwide fame after playing an orange Oompa Loompa in the 1971 film "Willy Wonka and the Chocolate Factory." 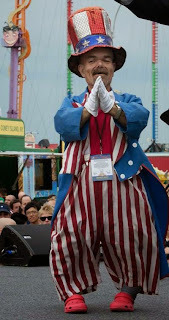 He later became a fixture in Coney Island, and was particularly known for his impersonation of "Uncle Sam" at the annual Fourth of July Nathan's Famous Hot Dog Eating Contest. George Shea, the contest's host, said he and other performers plan to remember Mastrangelo with a special sendoff. "Jimmy was the prince of Coney Island. He had a kind of presence that cannot be replaced, " Shea said. "He was a performer through and through." "Coney Island will send Jimmy off in a grand way," he added, noting the community will hold a memorial for the beloved actor this summer. Soon after police took down a statue of whistleblower Edward Snowden at Fort Greene Park, a hologram was put up in its place. The website Gothamist.com reports that a group known as "The Illuminator Art Collective " is responsible for the 3-D projection of the former National Security Agency worker. The group says they were inspired by anonymous artists who installed a 100-pound bust of Snowden in the park on Monday, April 6. That statue was covered and removed by parks workers. The artists say their goal was to honor the man who leaked classified NSA information to the public in 2013. Snowden,charged with espionage, sought and was given asylum in Russia. The fourth Brooklyn man arrested on terror charges is expected to be arraigned Wednesday, April 8 in Brooklyn federal court. Dilkhayot Kasimov was charged with conspiracy and attempting to provide material support to Islamic State militants. The U.S. Attorney's Office said the 26-year-old Uzbekistani national provided financial support to three other Brooklyn men who planned to fly to Turkey and then Syria to join the terrorist group. The three others have pleaded not guilty to all charges. Officials credit the firefighters' swift response. "Frame buildings, go up pretty quick,"said FDNY Batalion Chief Mike Bolini." Fire had met us right at the door, so to get in to make our searches, we had to push with the hose lines, to get in quick, especially with the reports of kids trapped, so the guys did a great job, worked hard, and glad the results turned out the way they did,"
One firefighter had minor injuries. The cause of the fire remained unclear by posting time. After opposition from residents over a plan to rebuild Sandy-destroyed bathrooms next to the Oceana Condominiums, the Parks Department says the public facilities will be installed instead at Coney Island Avenue and the boardwalk.